H Andy Power has been repairing lawn and garden equipment for decades. Now he would like to lend a helping hand with tuning up your machine. I know how intimidating it can be to try and fix a piece of equipment the first time - especially of you are not ‘mechanically inclined’. That’s why we developed a series of E books to help you every step of the way. No experience is needed! Let me show you how to get the job done right. Everything you need to know is covered, from parts, tools and safety equipment. Plus, I will share the ‘tricks of the trade’ that will help anyone feel like a professional in no time at all. No one does it like H. Andy Power! Who is this H. Andy Power, anyway? Times are tough for everyone right now. The bad thing is, the darn grass keeps growing! To help you out, H. Andy Power has made the following books available for download. If you like the books and find them helpful, consider making a donation in the amount of your choice. 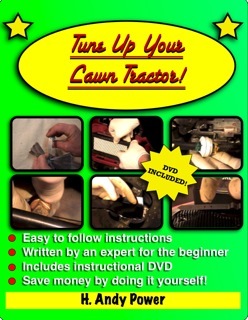 This downloaded PDF book covers the basics of a walk behind (rotary) lawn mower tune up. DOWNLOAD TUNE UP YOUR LAWN MOWER! Tune Up Your STRING TRIMMER OR LEAF BLOWER! This downloaded PDF book covers the basics of a STRING TRIMMER OR LEAF BLOWER TUNE UP. -Fill your cutting head with line! DOWNLOAD TUNE UP YOUR STRING TRIMER OR LEAF BLOWER! Ever wonder how an internal combustion engine works? Do terms like 'venturi' and 'Magneto ignition' mystify you, and keep you awake at night? Fear not! H. Andy Power has all the answers in the book "How Your Engine Works!" DOWNLOAD How Your Engine Works!